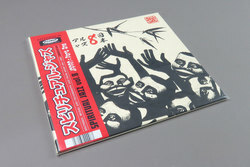 Various Artists - Spiritual Jazz 8: Japan, Pt. 1. Vinyl LP. Bleep. Wow! Insane collection of spiritual, modal and progressive jazz stylings from 20th century Japan. Whether you’re a real specialist or blissfully uninitiated, this is undeniably worth your attention. Top quality package as always from Gerald Jazzman as he assembles sweet, doe-eyed cover versions (‘My Favorite Things’) and haunting, deeper than deep cross-cultural excursions (‘Ragam Sinthubairavi’). Closing off proceedings are New Direction for the Arts with the epic ‘Sun In The East’, a fitting title for a compilation which aims to shine new light on these Eastern gems for a worldwide audience.